The experience is probably a common one. You find yourself out in public and see a person from the back or side and say to yourself, “Hey, that’s Mike! (or Sarah, Ted, Mary, etc. ),” only to discover when the person turns that you behold the face of a stranger. The shape of the head, the hair, or some other accidental resemblance threw you off, but the face gave it away. This was a stranger. Because if there is anything you can recognize in your friend, it’s his face. The face reveals us, and that at different levels. Those who know us best can often read our emotions and deepest thoughts in our face. Indeed, it has. There is a long Christian tradition of devotion to the Holy Face of Our Lord, rooted, as so much of the Religion is, in the Messianic hopes of Israel. There are four Psalms wherein king David begs God to “turn not away thy face” either “from me” or “from thy servant” (26:9, 68:18, 101:3, 142:7). Elsewhere, the Psalmist says, “Convert us, O God: and shew us thy face, and we shall be saved” (79:4, cf. vs. 8, 20); and “Make thy face to shine upon thy servant; save me in thy mercy” (30:17). This is but a small catalogue of such “facial” references to God in the Psalter. The Aaronic priests of the Old Testament offered a trinitarian form of blessing in these words: “The Lord bless thee, and keep thee. The Lord shew his face to thee, and have mercy on thee. The Lord turn his countenance to thee, and give thee peace.” (Num. 6:24-26). Note the second invocation, italicized here; it is obviously a foreshadowing of the Incarnation, when the mercy of God would deign to grace the world with a human face that really shows us the Lord. “He that seeth me seeth the Father also” (John 14:9) said Jesus, whom Saint Paul called, “the image [εἰκὼν, icon] of the invisible God” (Col. 1:15), and concerning whom that same Apostle says that God deigned to shine in our hearts “the light of the knowledge of the glory of God, in the face of Christ Jesus” (2 Cor. 4:6). In the sixth century, that Holy Face became the object of a particular devotion when the Mandylion of Edessa was discovered stored in the walls of that Syrian city while they were being repaired. The image was associated by the populace with accounts of King Agbar of Edessa, who was brought an image of Christ by Saint Jude Thaddeus to cure him of his ailments. (It is owning to this story that Saint Jude is so often portrayed with an image of Our Lord). Eusebius of Caesaria, the fourth-century Church historian, wrote of Saint Jude’s delivery of the image to Agbar as a fact, and so did other ecclesiastical writers. Both Saint John Damascene (d. 749), and Pope Gregory II (d. 731) took the account to be a true one. This image, counted an acheiropoieton (αχειροποιητον, that is, “not made with hands”) was eventually moved to Constantinople, and thence (after the terrible sack of that city by the Crusaders) to France. There are those who believe that this Mandylion is none other than the Shroud of Turin, a case which is made on the website of the Melkite Greek Catholic Eparchy of Newton. The possible identity of the Mandylion with the Shroud aside, the former served as a model for icons of the Holy Face of Christ for a very long time, and seems to have impacted the art of iconography wherever it traveled (the same is said of the Shroud). A whole genre of icon derives from the Mandylion, of which a beautiful example is the Image of the Savior Made Without Hands by Simon Ushakov. 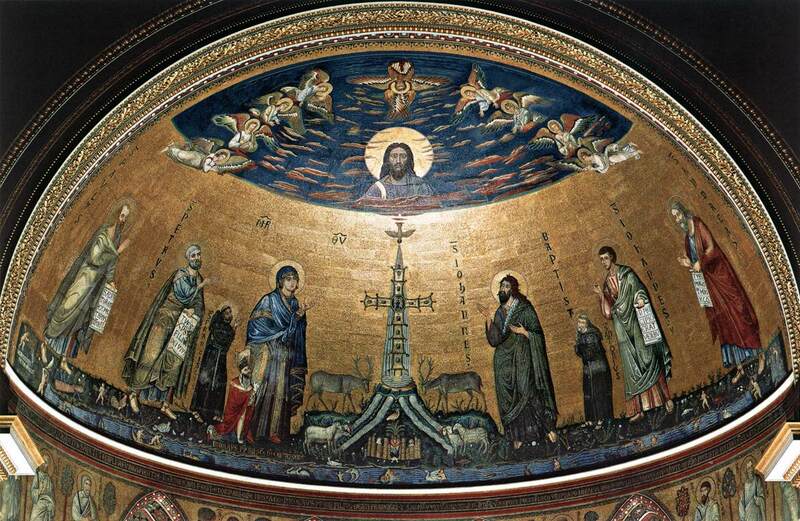 Images of the Holy Face have long been associated with the Basilica of the Holy Savior in Rome (known also as Saint John Lateran), and likenesses of that Face as it appears in the apse mosaic are visible on the exteriors of various buildings in the neighborhood of that important Church, which is the Pope’s Cathedral as Bishop of Rome. Veneration of images of the Holy Face was practiced universally in both the Christian East and West. In the 1840’s, Sister Marie de Saint-Pierre, a Discalced Carmelite nun in Tours, France, received a series of revelations from Our Lord, who said that He wanted prayers to be offered in reparation for the profanation of Sundays and blasphemies against His Holy Name. The particular reparation He called for involved the adoration of His Holy Face. The exact date of that “third day” was January 6, the feast of the Epiphany, which word means “apparition,” or “manifestation,” something of significance given what we said of the face of a man being that by which chiefly we know him. The gradual circulation of copies of the Veronica (as the veil itself is known) after the “Miracle of the Vatican” helped to popularize the devotion — especially in France. The images would, in fact, continue to be made and distributed well into the twentieth century. One of the families that joined an Archconfraternity established to honor the Holy Face was the Martin family, who gave us Saint Thérèse of Lisieux. Her full religious name, be it recalled, was Sister Thérèse of the Child Jesus and the Holy Face, and if we attend to this photo of her (one of several such), we can see that the small “diptych” she holds portrays both the Child Jesus and the Holy Face, the latter image being a replica of the Veronica. The profundity of Saint Thérèse’s devotion to the Holy Face can be seen in the two prayers and lovely “Canticle” that she composed in Its honor. Her emphasis in the devotion seems to have been on imitation and union, rather than on reparation. In 1936, the first year of the horrible Spanish Civil War, Our Lord spoke to Blessed Maria Pierina De Micheli, a religious sister who, though an Italian from around Milan, belonged to a religious congregation known as the Daughters of the Immaculate Conception of Buenos Aires. The message she received was once again one of reparation. This time, Our Lord commanded a medal to be struck. The image of the Holy Face on this sacramental is not that of the Veronica. Owing to the amazing 1898 discovery of Secondo Pia in his darkroom, namely, that the Holy Shroud of Turin is dramatically more visible when a photonegative is developed, the image of Christ on the Holy Shroud became more popular than the Veronica. The Shroud was, therefore, the model for the Holy Face medal. Thy face was beautiful before, but in this journey it has lost all its beauty, and wounds and blood have disfigured it. Alas, my soul also was once beautiful, when it received Thy grace in Baptism; but I have disfigured it since by my sins; Thou alone, my Redeemer, canst restore it to its former beauty. Do this by Thy Passion, O Jesus. The sacred countenance of Our Lord, worthy of adoration, is the object not only of painting and the plastic arts, but also of music and poetry. Returning to the theme of painted or sculpted images being a channel of grace, we conclude with some ideas inspired by Saint Thomas. The more he meditated on the subject, the more the holy Dominican realized that, as Christ is the mediator of grace, supernatural grace is not just the “grace of God,” but also the “Grace of Christ.” Borrowing a figure from Saint John Damascene, Saint Thomas said that the sacred humanity of Our Lord is itself an instrument of the divinity, but a “joined instrument,” like a hand, not an unjoined instrument like a chisel or brush. Here is the radical conclusion of his reasoning: When God uses this instrument in our sanctification, it leaves its “marks” on us; therefore, grace makes us Christi-like.